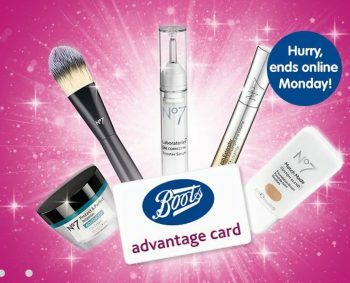 This weekend Boots is running a special promotion with No7 products. If you spend £30, you will get £5 worth of Advantage points. The offer is available in store and online. In addition to the bonus points promotion you currently get 3 No7 products for the price of 2. So, if you like No7 make-up and creams, now is the time to buy. You can find all No7 products included here. The offer ends on Sunday in store and online on Monday 17th September.